Kangaroo's Ultra 3000 premium blend has been scientifically designed for women to inscrease pleasure and performance. 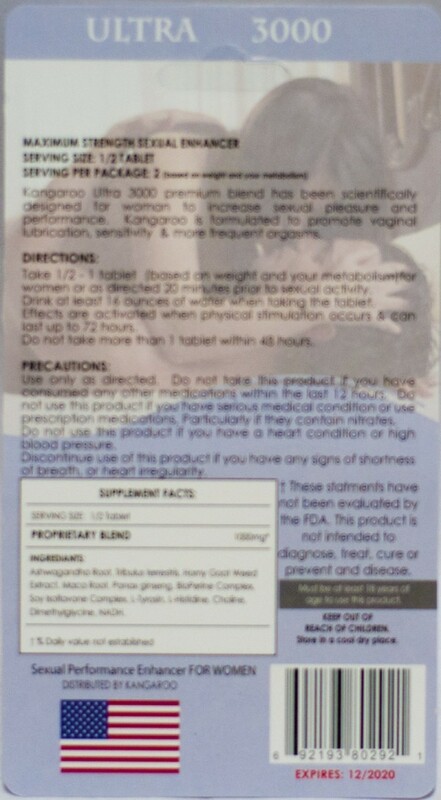 Kangaroo is formulated to promote vaginal lubrication and enhance longer & more frequent orgasms. I tried a few home remedies to increase my desire. I found myself not well disciplined to take the loose herbal remedies on the correct interval. Then i learned about this product. I am pleasantly surprised by this. I read a few reviews on Amazon that these pills don't work. I found the product here and preferred to buy it from a website since amazon sellers are hit or miss. Product does help with lubrication and i become very sensitive. I don't think it helps with relaxation though. I can't relax when all i want to do is just on him nonstop.